Your Neighborhood Heating and Cooling Specialists are always working to help our neighbors, friends and families with their heating, venting or air conditioning (AC) needs. Sometimes we see things that we need to make people aware of that don’t always occur, but could be really dangerous if they do occur in your home. We’re going to be discussing a case where one of our Neighborhood Heating and Cooling Specialist came across a Gas Furnace Flame Roll Out. We’ll discuss what that means and what you should look for if you think this might be happening at your home. Fox Plumbing & Heating was called out to the University District (U-District) the other week for a regular maintenance call for an existing customer. 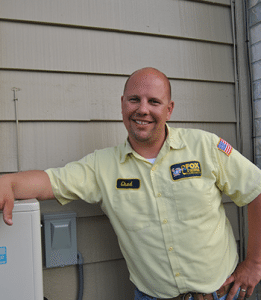 When our Heating and Cooling Specialist arrived at the house, he found a gas furnace that was from the early 90’s. During the maintenance of the Gas Furnace he noticed something unusual, a six-inch flame roll out when he turned the system on. If you notice smoke or flames coming from you furnace then you need to call a professional heating specialist right away, as in, stop reading this blog and pick-up the phone and call Fox Plumbing & Heating at (206) 654-4990 right away. The Dangers of Gas Furnace Flame Roll Out! Gas furnaces are traditionally one of the safest types of furnaces to own. However, as with any mechanical devices, they do need routine maintenance and repair. Gas furnaces also have a life expectancy of about 15 years, at which time they should be replaced according to national standards. This is because even the non-moving parts will degrade from corrosion and soot damage over time. Fox Plumbing & Heating has seen that people who don’t replace their gas furnaces in a timely manner can lead burners and heat exchangers to develop a very dangerous flame roll out condition. What is a Furnace Flame Roll Out? Gas furnaces create heat by mixing air and natural gas that travels through a burner and heats up a metal heat exchanger. A heat exchanger is a piece of heating equipment inside the furnace that transfers heat from one medium to another. They tend to look like two pieces of metal with pins and a handle – like the one in this picture. The combustion chamber is separate from the heat exchanger that gets forced air blown over it. The forced air is then heated by the heat exchanger, and the warm air exits via the heat ducts in the home. The burners of a gas furnace are at the bottom of the heat exchanger. All the parts of the unit from the burners to the heat exchanger are made of metal. Over time, corrosion and combustion deposits begin to interfere in the travel of gases from the flames to up and out the flue. When the air and gas exchange breaks down, flames that were once confined to the burner spread out as a flame roll out. Why is a Furnace Flame Roll Out Dangerous? When the flames are not confined to the combustion chamber, the surfaces and other objects in the furnace that are not designed to withstand such high temperatures become damaged. Wires, plastics and other components can catch fire when exposed to furnace flame roll out. Many furnaces have a flame roll out switch that cuts off gas to the burners when flame roll out is detected through temperature sensors. These safety devices are not always on furnaces that are over 20 years old. Also, we have seen instances of the safety switch being circumvented by the homeowners or even other repair personnel during maintenance or installs. In case you weren’t sure, yes, this is very dangerous. Heat exchangers with cracks or holes that have rusted through will also cause a furnace flame roll out. The danger of a flame roll out is combined with the fact that gas furnaces use Carbon Monoxide (CO) gas, which can pour into the home. CO gas is deadly in small concentrations, and it’s odorless and tasteless so it cannot be detected by a person's natural senses when it’s present. To learn more about the dangers of CO poisoning, check-out our previous blog on this topic here. A gas furnace flame roll out is a serious and potentially deadly safety concern. You can see signs of a flame roll out by looking for a discoloration of the exterior painted surfaces around the combustion chamber. In the early changes, there may not be any exterior indication of a problem. This is one of the many reasons that Fox Plumbing & Heating believe that annual furnace safety inspections are critical. Regular heating system and furnace maintenance will help prevent furnace flame roll out and make sure that you are aware of this as soon as possible, when you call an expert Neighborhood Heating and Cooling Specialist. In the case of the gas furnace in the U-District, our Heating and Cooling Specialist made the homeowner aware of the problem by opening the conversation, “We only have a small problem, your furnace is shooting a six inch flame out, but next to that everything is GREAT!” The customer laughed, and then asked Fox Plumbing & Heating to replace their old gas furnace with a new one. If you think that you might have a possible flame roll out issue with your furnace, or if you just have been putting off your annual furnace safety inspection remember; ‘Think Out of the Box… Talk to Fox!’ and call us at (206) 650-4990.